Welcome to the final installment of C.C. 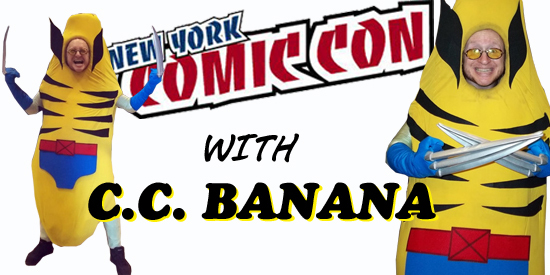 Banana’s adventures at the 2011 New York Comic Con! 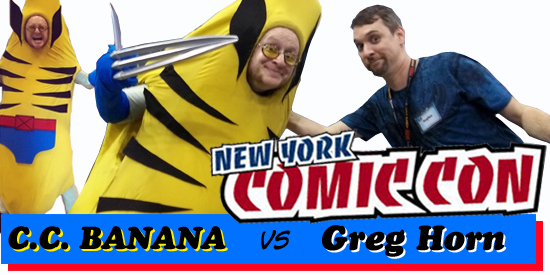 Today the Banana (in the guise of Wolverine) takes on the talented Greg Horn. As with his earlier interviews with artists Cully Hamner, Geof Darrow and David Finch, it starts off serious but then takes a few unexpected turns! Greg has actually been interviewed by C.C. Banana once before, so he comes prepared for this latest encounter. Who will emerge victorious in this ferocious fruit face-off? Read on and find out, bub! C.C. Banana Slices His Way Through New York Comic Con! Prepare yourself for what will surely be the most unusual coverage of the 2011 New York Comic Con you’ll find anywhere. Today begins our weeklong series chronicling the NYCC from the eyes of our special guest correspondent C.C. Banana. For those of you unfamiliar with C.C. Banana, get thee to Google! The amazing nanner man has been around for years and is responsible for some of the most irreverent and entertaining interviews you’ll ever find. From comic book creators to sci-fi icons to your favorite rock stars, the Banana has interrogated them all (and usually leaves them laughing in the process). More about this fantastic fruit can be found at his official website and YouTube channel. Midtown Comics TV at New York Comic Con! Take a look at all our coverage from the 2011 New York Comic Con! NYCC Aftermath: Shattered Heroes of Midtown?!? MIDTOWN BLOGGORDONEZES! Raph here, still recovering from NYCC! The show was an unmitigated success, and truly has become the largest event on the East Coast relating to the stuff we love! I only kid with the title of course, but I did want to talk about a small concern I had before the con. New York Comic Con is here! It’s one of the two greatest comic-cons in the U.S., and it’s one of the top five highest attended events in NYC! As the official retail sponsor for NYCC, we will once again have a huge booth offering everything you need for the ultimate con experience! Some of the highlights include our NYCC exclusive “Batman Arkham City” hat from New Era, a Midtown exclusive Ultimate Spider-Man symbol t-shirt, a bunch of cool creator signings, and of course, a HUGE selection of graphic novels at 20% off! Our Times Square store is a 10 minute walk from the Javits Convention Center, so we’ll be open from 10:00AM to 10:00PM on Friday October 14th and Saturday October 15th, (at Times Square only). Still need a ticket to NYCC? Midtown’s got you covered! You can purchase tickets to New York Comic Con at all three of our NYC locations. However, we are completely sold out of all passes except 4-day passes — get yours today and attend VIP day with press & pros! If you’re looking for great deals on graphic novels and trade paperbacks the Midtown Comics booth is for you! Save 20% off all graphic novels and trade paperbacks at our booth all weekend at the con! We’ll have a lot of hot books by many of the creators appearing at NYCC! Win a chance to meet Frank Miller at the Midtown Comics booth! 15 lucky winners will be selected via three different raffles and will win a copy of Frank Miller’s new book Holy Terror and get to have it signed by the man himself at the Midtown Comics NYCC booth on Saturday! Five tickets will be raffled on our Twitter page, five on our Facebook page, and five at the convention. Be sure to follow us on Twitter and Facebook for more info and your chance to win! 5:45-6:15 — Frank Miller VIP Signing for Holy Terror. Only 15 lucky winners will attend, see contest above. This year Midtown Comics will be the exclusive dealer at NYCC of the new Batman Arkham City hat! We’ll also feature a huge selection of other superhero themed New Era hats! The Midtown Comics booth will be the exclusive retailer for the new book The Batman Files from Andrew McMeels Publishing and we’ll be having a signing with its writer Matthew Manning on Saturday at 11:30! The Batman Files won’t be available to the rest of the world until October 25th! We’ll have a great selection of our Midtown Comics exclusive shirts available at NYCC including our Ultimate Spider-Man costume shirt, and HYDRA symbol shirt! Back-Issue Man Alex Rae will be the Grand Poohbah of our booth, hawking back issues for only FIFTY CENTS EACH (along with some choice comics for a whole lot more than fifty cents)! Alex will be buying back issues as well, and he’s been given carte blanche to spend big bucks on key issues from the golden, silver and bronze ages. Bring Detective Comics #27 or Hot Stuff the Little Devil #1 (Harvey, 1957) with you-he’ll buy them, and almost anything else! Remember to follow us on Facebook and Twitter for updates, special deals and savings!